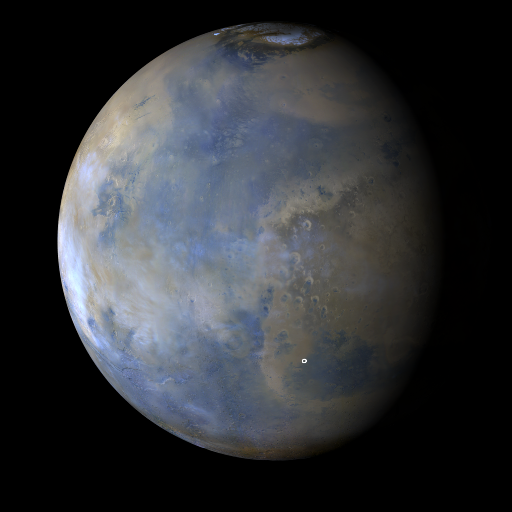 Small transient dust storms were spotted over Solis and Syria Planum this past week. The aphelion cloud belt, comprised of condensate water-ice clouds, dominated the equatorial latitudes all week. Apart from dust haze over some areas, dust-lifting activity was diminished across much of the northern lowlands. Each afternoon, skies were storm-free for the Curiosity rover site in Gale Crater and the Opportunity rover site in Endeavour Crater. Malin, M. C., B. A. Cantor, A. W. Britton (2018), MRO MARCI Weather Report for the week of 1 January 2018 – 7 January 2018, Malin Space Science Systems Captioned Image Release, MSSS-512, http://www.msss.com/msss_images/2018/01/10/.